One of the rooms I get the most questions about on Instagram is our downstairs guest bedroom. I will start off by saying that this room is particularly special as it has been named as the “Nan Room” in honor of my mother. (A little back story, we are best friends and share a middle name) Basically, this space is her domain and she has an open invitation to visit whenever she can make the trip. 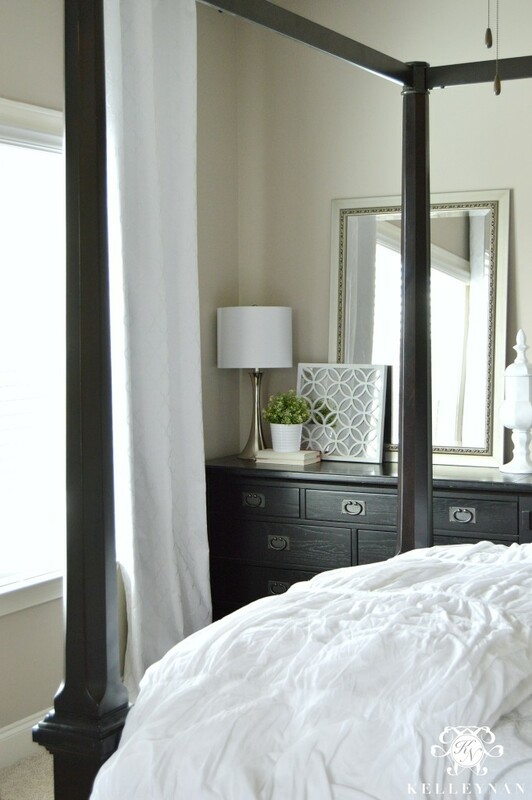 We have another guest room which isn’t shown often as I am vying to give it a makeover, and another vacant room connected to that room through a Jack and Jill bath. One day… one day… But, today, I wanted to give a peek inside the little room behind the French doors. Since we only moved in our house months ago, we prioritized areas and many spaces we still have “interim” furniture and decor. While very little has been purchased for the “Nan Room”, and there are changes and upgrades I would like to eventually make, a few textiles to freshen the space is all we had to add from what we initially moved. 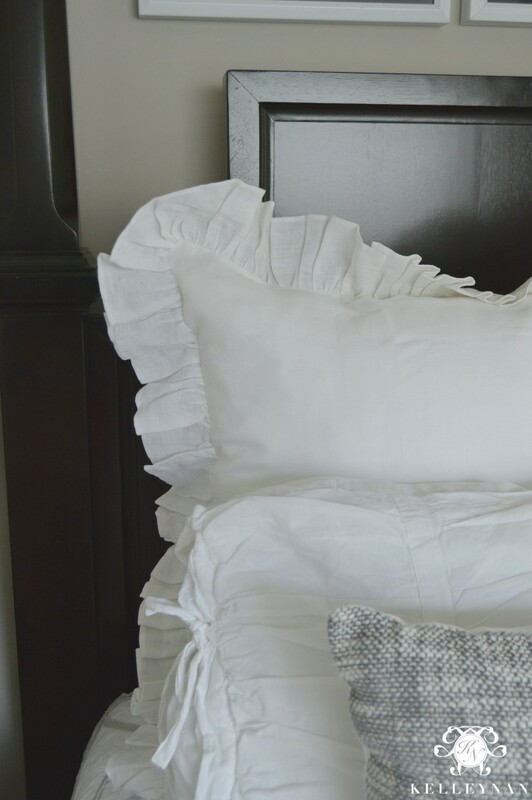 My absolute favorite bedding addition is the large, linen ruffled euro pillows in the back. 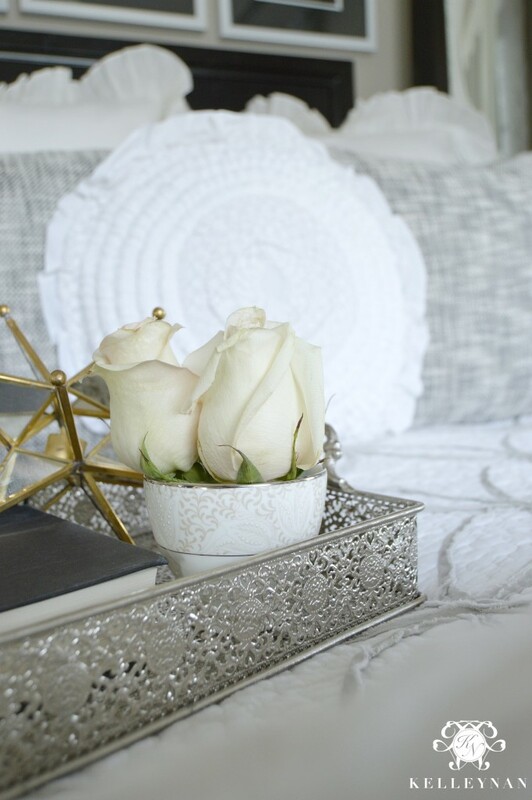 I previously had plain white quilted euros and I can’t believe the sweet impact these make, especially against a traditional, dark, four-poster canopy bed! I am a sucker for linen, frilly, southern goodness and these were just the ticket. They aren’t too girly which was also important to me. 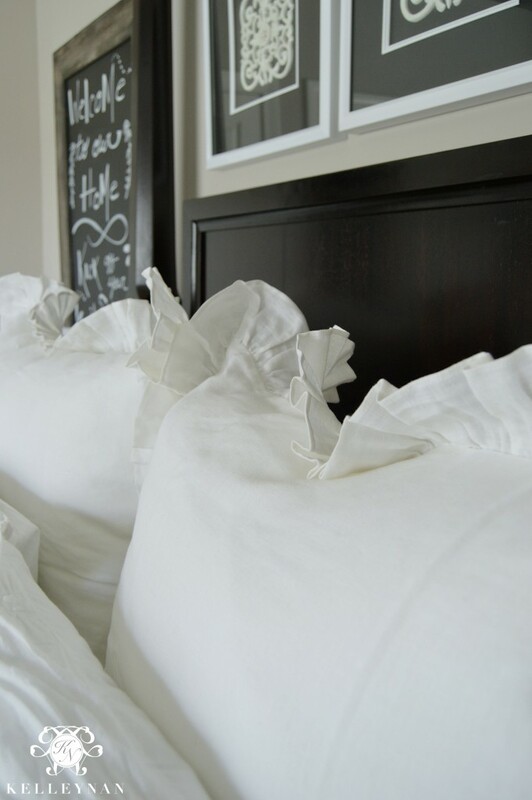 You can find these through Superior Custom Linens HERE. They are handmade and are available in a variety of sizes, but these are the largest at 26×26. When I finally do pull my other guest rooms together, these will be a staple. We have had most of the other bedding for a while, but just like our master bed, I like to layer my bedding to give it a full, plush look. I like to keep a duvet folded at the foot of the bed; it serves double duty in both the practicality and looks department. As a matter of fact, I love this particular duvet so much, that I actually have the same one in my master bedroom. 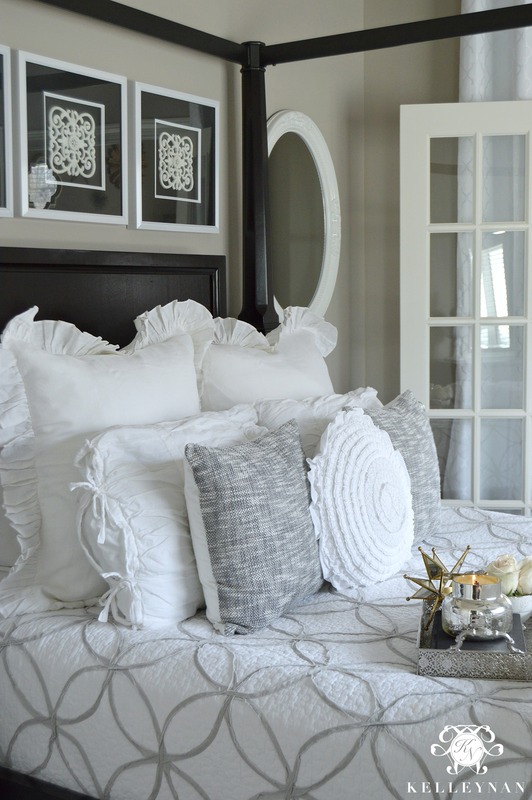 You can find this duvet and the matching shams (the pillows in front of the ruffled euros) HERE. I lucked out and found all three of my throw pillows in one stop. 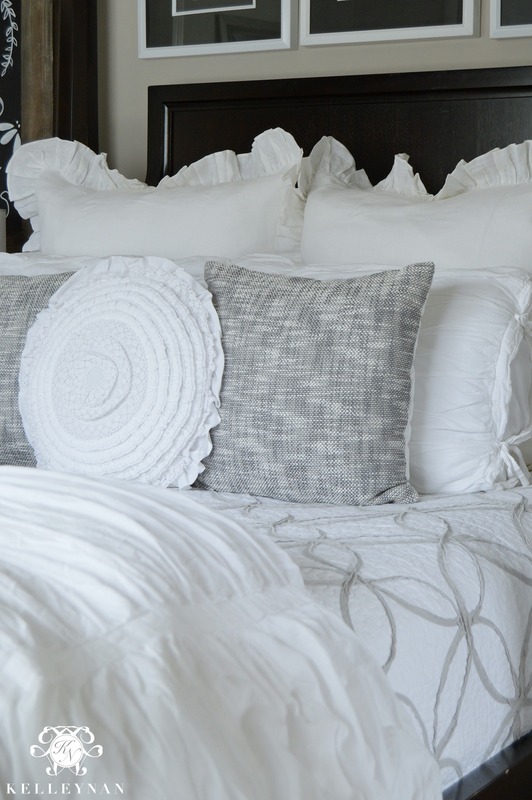 You can find the white round center pillow HERE and a pillow similar to the gray HERE. 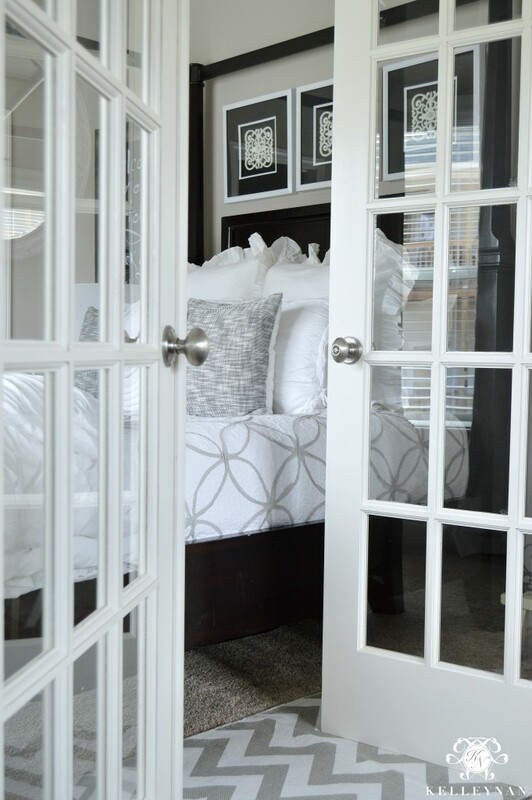 Regardless of this room being on the smaller side, I knew I wanted to make the “Nan Room” the home of our queen-sized canopy bed. And, since we leave the French doors uncovered, I wanted something which would make more of a statement since it is visible from the sitting room, just inside our foyer. Somehow, the one small-ish room, plus two doors swinging inward, plus one large canopy bed just worked. and have them EVERYWHERE) on top of a couple of books (which I also tend to use everywhere). Oh, and that white piece on the right side? I scored that for 90% off at Hobby Lobby. I went with work perfectly for privacy and the grommet style top lets them slide across the rod with ease. I secured them with wraparound, curved curtain rods which extend so far, I was able to run them across the full length of the room. When no one is staying in this room, the curtains stay tucked behind the short walls framing the French doors, perfectly out of view. is the best chalkboard marker I have found. The corners are good for thin lines while each side provides two widths for wide strokes. The bedside is very simple with a small black table and lamp- I absolutely love the lamp but cracked the shade during our move. I popped the broken plastic out to leave only a thin layer of material, but you can’t even tell. You can find this lamp, fully intact, (haha) HERE. I like to have flowers in the “Nan Room” when my mom comes in town; much like “thank you notes”, it’s a habit that she taught me and I am working to have that little touch present consistently. You don’t have to have a big bouquet to make an impact though. A small tea cup, bud vase, or creamer pitcher with a couple of blooms can still be beautiful. I love using these teacups from my china. Thank you for taking the time to tour this small but special room. She is a work in progress but I will continue to make small updates as time (and priorities) allow. Stay tuned for other room tours, coming soon! 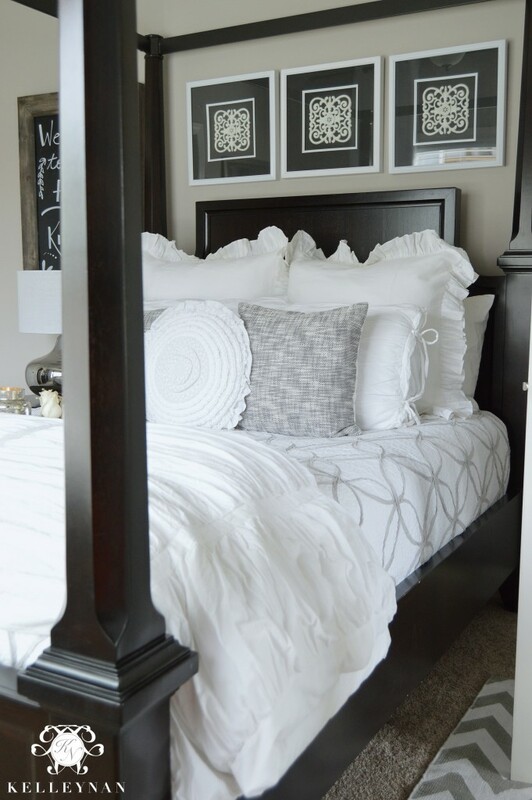 While our bed has been discontinued, I found a similar style canopy bed HERE. While this is a Sponsored Post and I received product and/or compensation, all opinions are my own. I wish this was my bedroom! It’s beautiful and so welcoming! I would love a quilt like that. In fact my husband is in the US working right now and won’t bring me the Target one you suggested! I said he can just carry it on the plane but he said no. How sad! Awww!! And thank you! Do you have Target in the UK? Wishing you luck in finding your perfect quilt! Angie, your comment made my day! haha Thank you so much for taking the time to visit! This room is absolutely beautiful. 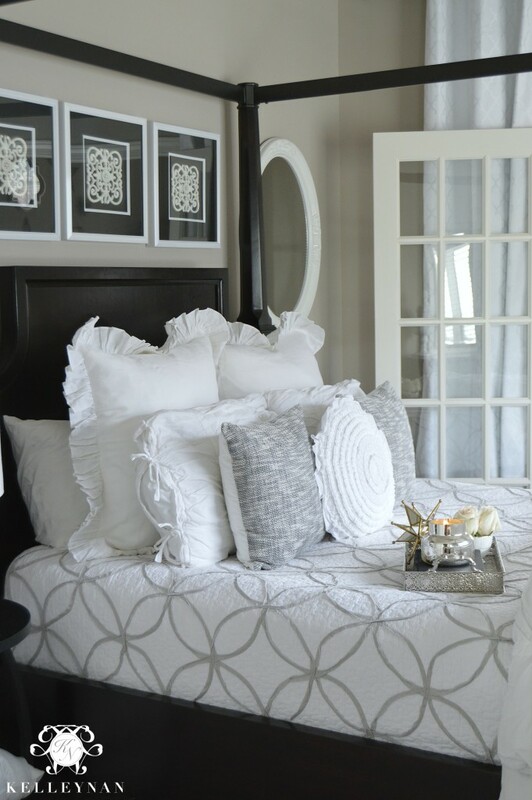 I am starting my guest bedroom project and I am using this as my inspiration. I love the pictures on the wall above the bed, can you please tell me where to find them. Delia, thank you so much; ow fun to be starting a new project!These came from HomeGoods a few years ago but I bet you will find something fabulous! 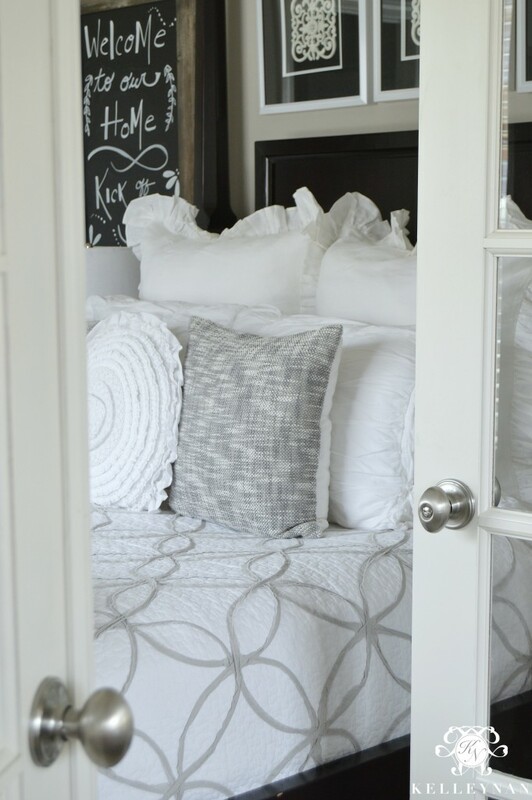 Kelly, I adore your style, especially this quilt choice! Which brand is the quilt? Maybe I can check on Amazon for it. I’m in love with it! 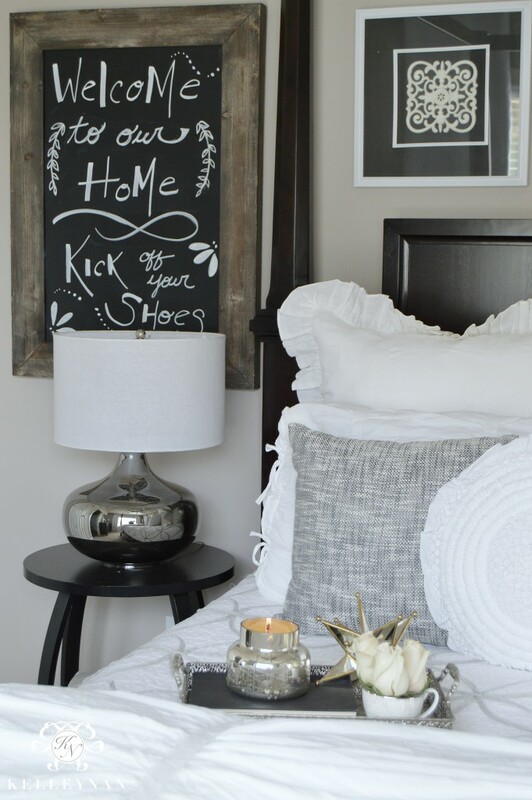 I was fortunate enough to find you through another favorite blog (Southern Hospitality) and I am obsessed!! We have such similar tastes ( also a lover of all things Southern) and I’ve learned so much by ” touring” your gorgeous space! Wow so many things I’ve never thought of, I love the attention to detail! 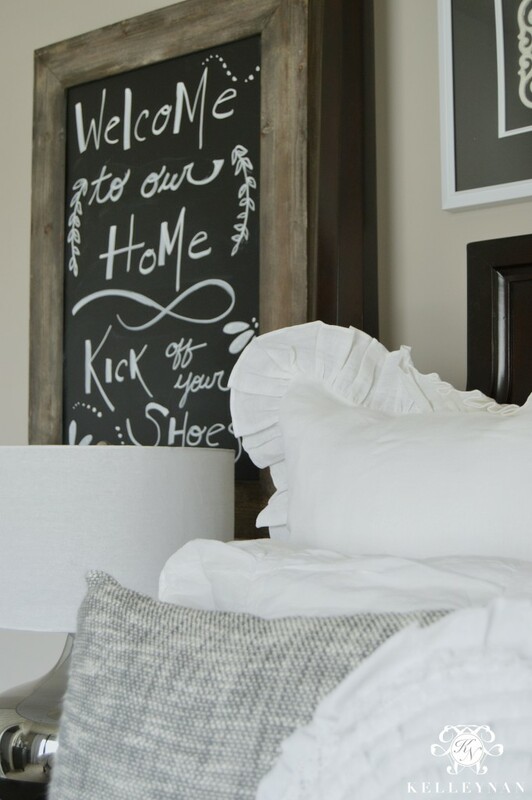 I’ve lived in my home 17 years and EVERY room needs a refresh. I’ve loved it…until I didn’t… and was overwhelmed, never quite finding “the look” I was going for. Now that I have I need to win the lottery! 😉 I love that you and your mom are best friends – my mom and I were too. What a precious gift. 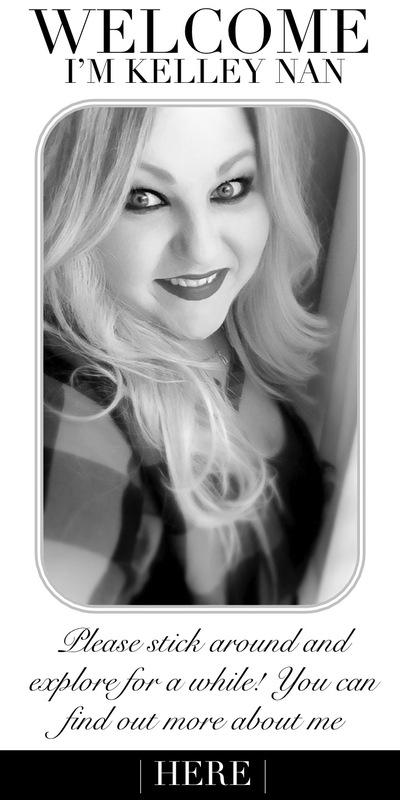 Thank you for all you share and hugs from one of your newest fans!! Hi Kelley, I love your blog! I was wondering if could tell me where your black dresser is from ? Thank you! Great beautiful bedroom.very clean and simple colourful bedroom.I make a bedroom like this for my guest. Once again a great job Kelley! What is the wall color? Can I come live in Nan’s room Please? Haha I am sure she would share!